The hospitalization rate among children under 5 due to unintentional poisoning fell from 40.9 per 100,000 children in 2006/07 to 32.7 in 2012/13. Poisoning in young children is most often caused by medications.1 Child resistant containers have made a significant impact on reducing childhood poisonings. That is why it is very important to keep medications stored in their original packaging. However, sometimes children can get into these packages – so they should also be stored out of the reach of children – preferably in a locked cabinet. Disposing of unused/expired medication is also an important strategy to decrease children’s access to medications. Most pharmacies in Canada accept consumers’ medication for proper disposal. 1Parachute. 2016. 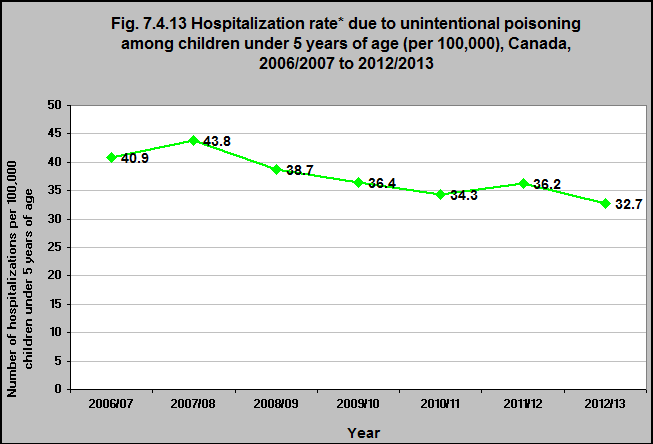 Poisoning hospitalizations data. http://injuryevidence.ca/visualizations/poisoning-hospitalizations-data/ -accessed June 21, 2017.